Exe boats. – Dirty wet dog , boats and sailing. A quick photographic tour of anything i find interesting on the river. I did originally think of doing this for each of the rivers that i sailed in this year but i completely forgot about it right at the start when i was in Fowey because apart from me there were NO boats afloat at all except for a few up at Golant. In Falmouth it was the opposite story : too many boats to really focus and pick out some interesting ones. Here the focus is very much on the small boats that are moored at Topsham itself and down to around Starcross : after that it just becomes a bit generic-eric in the deep water moorings down near the entrance on the western side. The eastern side over by Exemouth is a lot more interesting as once again all the boats dry out . During my quick walk across the sand i got this shot of a couple of multihulls on that side : one is definitely a Wharram Tiki 26…same as the one i had. Here at Topsham apart from a small group of deeper moorings nearly all the boats are small ie less than 25 feet and just about all of them sit on the mud so its a collection of the very boats that i am interested in now myself. The Cornish Crabbers are well represented here with a couple of the early Crabbers up near the bridge, a Shrimper or 2 and this one Cornish Yawl. I always liked the Yawl and the Shrimper but what put me off buying the Yawl is the plastic interior. Shrimpers are of course very popular little boats : i seriously watched out for a low priced one at one time as they are possibly the largest boat that i could contemplate keeping at home. If anyone starts muttering ‘plastic gaffers’ then fine if you don’t like the idea of gaff on a GRP hull but to me that’s as good/bad as post IOR fakery and nowadays boats trying to like like IMOCA 60’s or mini-transat yachts. Not sure what ‘Jessie’ is, i think the hull is tree-wood ! but i wouldn’t put hard cash on the guess. The red gaffer is i am pretty sure a plywood Dudley Dix design : i think its the Cape Henry design at about the same size as a Shrimper. One of a pair on the river. I really do like Dix’s designs especially the ‘retro styled 28 foot ULDB based on his 26 footer. One time when i was sailing my Frances 26 i had a direct one-on-one with the slightly larger 21 foot gaffer and had a real struggle getting past him. I couldn’t work this one out when i first saw it at a distance so i made a moorings detour to go and take a look. 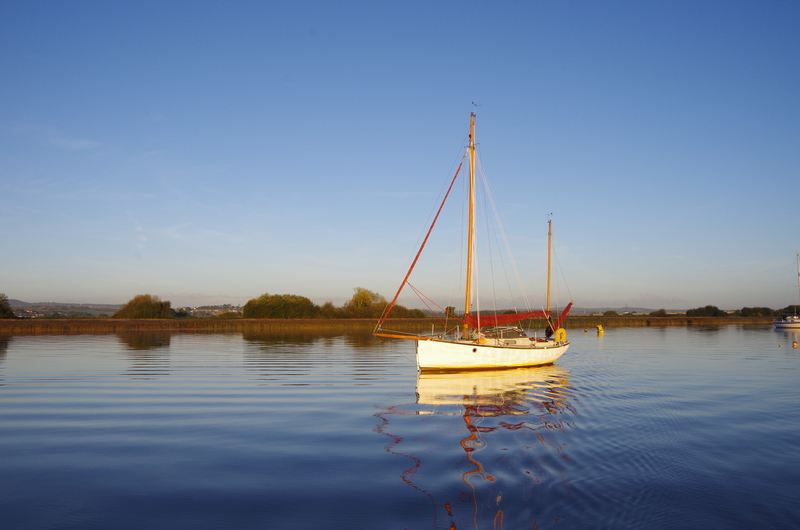 I think this one of Swallow boats deigns : the Bay-Raider. I have been taking a bit of interest in Swallow boats designs just recently as the odd looking newbie at our end is one of theirs which i don’t understand at all although their 23 foot water ballasted one and the Bayraider expedition look like great boats. In mainstream sailing there has been a real dearth of good small boat designs in the last few years and with boats like these its great to see new designs in the small boat market again. Another neat Gaffer, i didn’t catch the name on this one. On second look i think this one has been converted to Bermudan rig a bit like my short-lived Deben project : i think the rig change was wrong for that boat and might be for this one as well. Not sure what this one is…owner seems to have parked it on a sand-bank. Exemouth ‘Marina’ : what can i say except throw them all in a big heap and burn em all ! Todays story boat : the ‘E’ boat. Being an ex IOR junkie i still have a fondness for these boxy little ‘offshore’ boats and did think about having one for this project. Although shorter than the Liberty they are enormously wide for their length and they sail like a big dinghy. There are at least 2 on the river here. There is often one on ebay : just checked today and there is one at a buy it now at around a grand….rough as rats though ! There is i believe a more cruiser-racer version which has a low coachroof which would make the interior space more useable but there aren’t many of them about. My ‘E’ boat stories though. I was once told about one of these running hard down the menai straits in a strong breeze with a lot too much sail up and its big central hatch open. Story goes that the driver surfed it down the back of one wave and straight into the back of the next one : being a bit bow down she plunged into that wave and with water sluicing over the flat deck and down the open hatch…..just went straight down like a diving submarine ! In an earlier post i mentioned Bob Salmon who was skipper of Liverpool Enterprise in the Whitbread race that i crewed a couple of legs aboard. For those that don’t know Bob is the sailor and journalist who started up the whole mini-transat race and sailed in i think the first 2 : once in an E boat and once in a Parker mini-seal which he reckoned was the much better boat. Sadly Bob died a few years back so i have missed the opportunity to go interview him about his memories of the early days of very small offshore/ocean racing. Interesting though that more than one of these little IOR style boats have done ocean passages under race conditions. The little ‘E’ boat was a kind of direct precursor to the first generation of ultra-wide mini-transat boats. Nowadays the mini-transat boats are very extreme and difficult to sail boats although they are the starting point for most who have aspirations towards solo ocean racing. I know that Ellen Macarthur had one crack at the mini-transat before she became rockstar famous as she was setting that boat up just i was doing my last jobs in professional sailing. This is the kind of thing : very flat and wide, very deep but extremely narrow chord keels and maximum rigs. In a very direct way the wide and flat E boat was the direct precursor of the later more extreme mini-transat boats of today. Today i am far out of touch with this branch of racing sailing . The last time i saw these boats actually sailing was when the then-radical scow-bow design of about 5 or 6 years back came past us upwind when we were cruising the Frances 26. I definitely know which boat i preferred to be sailing but there again i am an old fart now. Mini-transat boats do seem to be the hot test bed for any radical idea going that might then make it onto bigger boats. I do like the idea of small boats racing (and cruising) long passages as it is a forcing ground for sailing development today . At some time in this blog i want to do a piece about the late Blondie Haslar who instigated the singlehanded transatlantic race : Bob Salmon’s mini transat really derives from that in its early form. On a similar note i really like events such as the Everglades challenge which uses beach launched boats for a 300 mile race although the boats don’t have to be sailboats. Talking about the E boat and the line of development into small and extreme race boats brings me full-circle into the last boat for this post : on the day the first one that i photographed. If i am right this is the little Beneteau 210 : essentially a small trailer sailer that seems to have its direct inspiration in the mini-transat yachts but with the most extreme features taken out. They are wide and have better useable interior space than say the E boat, they have a swinging keel and 2 shallower rudders and a decent rig. These little boats are ubiquitous over in French marinas and quite common here. I don’t know much about them except that they are a bit twitchy to sail but there again so are nearly all ‘E’ boats and similar IOR race boats. As with several of the boats i have featured today i did consider going down this route for this trip. I grew up with fast and twitchy offshore boats so i wouldn’t have a problem with the little bendy-toy but once again it was the all-plactic fridge-like interior moulding that put me off. Several of todays boats are ones that i have considered at some time as potential small cruising boats for this trip : my failed Deben project was for example an early attempt at this and that would have been a small gaffer just like several in this river. The Cornish Crabber early version would have done the job as would i think the little Shrimper. Budget was of course the constraint as my boat cost i determined would have to be inside or around £5.000 and the Liberty acheived that. The “Shed of the day” is nearly an ex-boat! Thanks for the escape Steve. I was so much on the edge of using that as a final pun during the writing ! can’t think what made me hold back.